GIVE BACK WITH RECIPROCITY NGO TODAY! 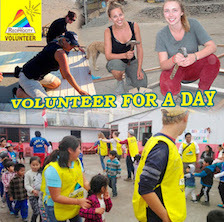 As a "Volunteer For A Day", you will be able to provide a service that will help enable the members of the shanty town communities to obtain basic needs and education. You will have the opportunity to visit the communities that Reciprocity NGO is currently working with and get firsthand experience on the different types of social projects that we implement. Along with a Social Projects Coordinator, you will meet local leaders, families, children, and dogs! The price includes pick up and drop off from your hotel in Miraflores or Barranco, 3-4 hours of volunteer work, and an English and/or Spanish speaking coordinator. It will be a great opportunity for you to practice your Spanish and/or English and meet volunteers from all over the world! Email ong.reciprocity@gmail.com to confirm availability!